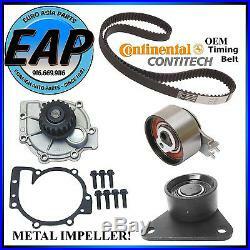 CRP Timing Belt with Water Pump w/ Metal Impeller, Tensioner & Roller. SPECIAL NOTE Please be sure to check the vehicle fitment notes below. You will need your engine serial number on some models to determine if this is the correct kit. 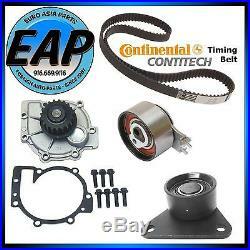 07853009038 ------ OEM Continental Timing Belt. 11253008 ---- Aftermarket Water Pump w/ Metal Impeller. 07953014 ------------- Aftermarket Idler Roller. INTERCHANGE (Vehicles this part fits). From Engine 1266128; w/ Mechanical Tensioner. W/ Mechanical Tensioner;From Engine 1266128. L5; 2.5L; To Engine 3188688. PLEASE READ BELOW BEFORE PURCHASING! The item "For Volvo C70 S40 S60 V40 XC70 To Engine 3188688 Timing Belt & Water Pump Kit" is in sale since Tuesday, December 18, 2012. This item is in the category "eBay Motors\Parts & Accessories\Car & Truck Parts\Engines & Components\Timing Components". The seller is "euroasiaparts" and is located in Sacramento, California. This item can be shipped worldwide.